1. Anadromy in brown trout (Salmo trutta): A review of the relative roles of genes and environmental factors and the implications for management. 2. Understanding anadromy as an individual adaptive behaviour: theory and its consequences. 3. Sea does matter: seascape heterogeneity influences coastal migration tactics and population connectivity in brown trout (Salmo trutta L.). 4. Population genetics and genetic stock identification of anadromous Salmo trutta from the Irish Sea and adjacent areas, using microsatellite DNA loci. 5. Variation in sea trout (Salmo trutta) abundance and life histories in the Irish Sea. 6. Catch and stock based Biological Reference Points for sea trout in England & Wales: A comparison of methods and critical examination of their potential application to stock assessment and management. 7. Trout recruitment, production and ova seeding requirements on a small coastal river: a case study from the Shimna River, Northern Ireland. 8. Estimating salmonid angling exploitation rates from systems monitored by fish counters and their potential applications to fisheries management in Ireland. 9. The relative importance of sea trout and salmon to the recreational rod fisheries in England & Wales. 10. Marine migrations and distribution of sea trout from rivers in Great Britain. 11. Simulation of movements of sea trout post-smolts in the Irish and Celtic Seas. 12. Genetic structure and tracking of sea trout (Salmo trutta L.) in the Rhine and Meuse estuary in the Netherlands. 13. 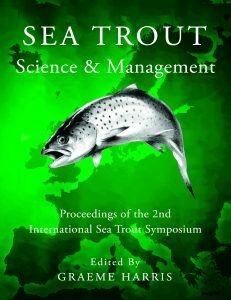 Marine Migrations of sea trout (Salmo trutta). 14. Migration pathways in a fjord of two populations of sea trout (Salmo trutta L.) smolts. 15. Migration behaviour and loss rate of sea trout smolts in the transitional zone between freshwater and saltwater. 16. Managing mixed stocks of sea trout (Salmo trutta L.) straying between rivers sharing a common estuary in Southwest England: a genetic approach. 17. The marine migration and swimming depth of sea trout (Salmo trutta L.) in Icelandic coastal waters. 18. Dispersal of post-smolt Atlantic salmon and sea trout within a Scottish sea loch system. 19. Do sea trout migrations promote interbasin connectivity between populations? 20. Feeding ecology of sea trout in the Irish Sea. 21. Migration behaviour of sea trout (Salmo trutta L.) in a large sub-arctic river system: evidence of a two-year spawning migration. 22. Using stable isotopes to assess the distribution and reproduction by migratory and resident Salmo trutta within river systems: some complicating factors. 23. Assessment and recruitment status of Baltic sea trout populations. 25. Calculating smolt production of sea trout from habitat surveys and electrofishing: pilot studies from small streams in Sweden. 26. Observations on sea trout stock performance in the Rivers Dee, Tamar, Lune & Tyne (1991–2014). The Contribution of ‘Index River’ monitoring programmes in England & Wales to fisheries management. 27. The collection of sea trout and salmon statistics from the receational rod fisheries in England & Wales. 28. Assessment of the increased mortality risk and population regulating effect of sea lice (Lepeophtheirus salmonis) from marine salmon farms on wild sea trout in Ireland and Scotland. 29. Sea Trout and Tidal Power: Challenges and Approaches. 30. The impact of small hydropower schemes on the migratory behaviour of sea trout (Salmo trutta L.) smolts in the River Frome, Southern England.